With a splash of magical ink, Okami's countryside springs gloriously back to life. When you enter a new region of Okami’s mythical vision of ancient Japan, the landscape is shrouded in a choking, otherworldly fog and patches of strange purple blight ravage the fields and forests. Where there were once trees, plants and wildlife, you find only death, decay, and roaming demons. This is the handiwork of the dreaded eight-headed serpent Orochi, whose creeping curse has seeped into the earth and poisoned it: a curse that you, the sun god Amaterasu, have arrived to lift. Playing Okami, you feel like the hero of some ancient fable passed down from generation to generation. The legend of the white wolf who vanquished a demon and brought peace and prosperity to a cursed world. Amaterasu, inhabiting the body of the aforementioned wolf, uses an artefact called the Celestial Brush to drive back the curse. With this she can control the forces of nature using techniques taught to her by fellow deities, such as making the sun suddenly rise or bringing dead trees back to life. What makes these powers extra magical is how you get to wield the Celestial Brush yourself, painting symbols with ink to trigger their various effects. Sumi-e, or ink wash painting, is a traditional form of Japanese art, which was often used to tell the kinds of stories you’re the star of in Okami. This is a wonderfully clever way of reinforcing the idea of being a part of, and creating, a mythology. And it’s also just really fun, painting a circle and watching the sun fill the sky with radiant light, knocking a cackling demon on its arse with a gust of heavenly wind, or blowing holes in things by conjuring up magical cherry bombs. But the most satisfying use of the Celestial Brush has to be restoring cursed zones. Find a patch of sickly, purple-tinged grass, paint some ink over it, and watch it explode with vibrant green foliage. Do enough of these and great swathes of land will be restored, revealing bamboo forests, sparkling ponds and grateful wildlife. You can even feed the creatures you free from the curse and little love hearts will pop out of their heads when they see you. It’s wholesome, and I find it impossible to leave a region behind without brushing away every trace of Orochi’s plague. Swirl a circle around a dead, blackened tree and you’ll see cherry blossom burst from it. Dig up a withered clover and you can make it sparkling and green again – a cute reference to Clover, the studio that developed the original, non-HD Okami, and which sadly closed its doors in 2007. As Amaterasu runs, she leaves a trail of blooming, sprouting plants in her wake, as if the very ground she walks on is blessed by her presence. And, finally, if you restore one of the towering guardian trees, the entire region recovers from the curse and is suddenly filled with life and colour. The longer you play Okami, and the more regions you rid of the curse, the more satisfying it is to explore the world. There’s some backtracking in the game, and sprinting through areas you’ve rejuvenated is rewarding. You feel like you’re making a difference and leaving a trail of positivity behind you as you progress through the game. The people you meet, although they think you’re just a dumb, fluffy wolf and are unaware of your godly powers, actually mention that the world has changed for the better and their lives have improved. 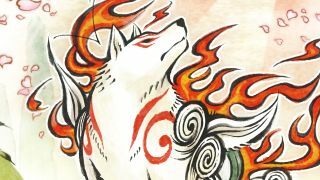 Okami understands that when you impact a game world, the folk who live there should notice. This restoration system is so inherently gratifying, I’m wondering why more games haven’t copied or riffed on it. A strange example of one that did was EA and Pandemic’s 2009 open world WW2 game, The Saboteur. Set in Paris, the city starts off grey and lifeless as the Nazis occupy it, but as you drive them away, colour and life comes back to the streets. But Okami’s version is still the best, and the 30 hours I spent restoring nature to Japan were a constant delight. It’s the closest thing we have to Zelda on PC: a big, beautiful, vibrant adventure set in a fascinating world, with a compelling story and rich characters. And I’m glad the HD version was finally released on PC, letting us experience all this joy in 4K.